(I actually received this message in 1997. We wish to share with you that your Primary Mission is about to begin. Once it begins, it will take on a life of its own. At that point, it will no longer feel like YOUR Mission, for YOU will no longer be an “individual.” YOU will BE a Multidimensional Being who is part of the very large group of your SELF. No longer will you have individual, ego-based control of your life. Instead, you will consciously be aware of myriad voices, visions and realities within your consciousness. All this stimuli must then be congealed into one clear, purposeful course of action. Because of this, it is vital that you create a strong foundation for this “journey back to SELF. You will need to completely and thoroughly ground your physical body, your psyche, your thoughts and your emotions in Gaia. 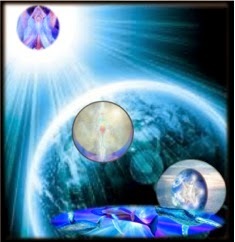 We are here to tell you that, just as it is essential to ground your physical reality in Gaia, it will facilitate your process if you also “ground” yourself in us, the Arcturians, and, me, IlliaEm. We are here to help you every step of the way. We can especially assist you in creating a more balanced life. Inevitably, this comes down to balancing the masculine/feminine and the spiritual/physical polarities. To fully move into complete balance with the Spiritual/Physical polarity, you need to find the place “in-between” the Masculine/Feminine polarity. The blending of the Masculine/Feminine polarity is vital to Blend into the Oneness. It was the polarizing of your androgynous SELF into male or female which allowed your first entry into the 3D Game. Conversely, it is the reunification of the male/female polarity that will facilitate your return to the Oness of Home. Once in the Great Oness, Spiritual and Physical is naturally balanced, for you will be BOTH. You will have learned the lesson of the Pentagram: head in the stars, feet planted deep in the earth, and heart wide open. Then you will be easily able pull messages down from your connection with us in the “stars,” ground them through your connection to the Earth, Gaia, and share them with ALL through your Opened Heart. A portion of everyone’s primary Mission is to assist in some manner in the planetary revival of the Power Within—the Female Power. The negative/female-charged electrons pull the energy in, whereas the positive/male-charged protons chase after and move the energy out. It is the pulling in and the moving out in a balanced flowing fashion that will awaken your Lightbody and expand your perceptions beyond the illusionary boundaries of your 3D earth vessel. As you balance your masculine and feminine aspects within your earth vessel, you create an equality of inward and outward forces, which will serve to accelerate the integration of the Higher Frequency Light. Every higher frequency that you can effectively bring into your consciousness, ground in the Earth, and integrate into your earth vessel, allows you to pull in even higher frequencies. Your male and female Essence works in a collaborative fashion to accomplish this task. Your Masculine Essence moves out, beyond the limits of your consciousness to pursue higher and higher vibrational dimensions, while your Feminine Essence acts as a “homing beam” to call back your masculine force and offer a vessel in which the higher vibration can be grounded. As you merge your Masculine/Feminine polarities, you also merge and integrate the Higher Light of your Spiritual Body with the third dimensional light of your Physical Body. “As above, so below. As within, so without.” The macrocosm is the template for the microcosm. The masculine Father/God force implants the possibility of new life into the feminine Mother/Goddess force to initiate a birth. YOU are the creators of this new life, each and every one of you—alone AND together—are creating the New Earth. Neither the masculine nor the feminine force is better. They are both equal. In fact, just as your first download into the third dimensions resulted in the separation of the male from the female, your balancing and merging the male and the female will herald your return Home into your true Multidimensional SELF. For most of Earth’s third dimensional reality, either Masculine OR Feminine was considered the “Ruler.” In the vast majority of civilizations, the patriarchal energy has been the Ruler of your Earth for many thousands of years now. Because of this your planet has become imbalanced, with the Force of Power being much more important than the Force of Love. Without the balanced of the Forces of Power and Love, it is very difficult to gain the Force of Wisdom. It is the balance of the forces of Power/masculine/out-flowing and Love/feminine/in-flowing that gives birth to the force of androgynous/power-within/Wisdom. This is why wise female leaders project a strong masculine energy and wise male leaders are intimately in touch with their feminine energy. You may not have considered Wisdom, Power and Love to be “Forces,” but indeed, they are. When you are in close proximity to a very powerful, loving or wise being, you can FEEL their “Force” emanating from their. Since your planet is now becoming more and more fourth dimensional, the illusion of the “superiority” of humanity will be lifted. Wisdom, Power and Love can reside within many of Gaia’s creatures, especially in the fourth dimension where physical form is not bound by the strict laws of separation and limitation. As your process of ascension continues, you will find that you can have many new friends who are non-human. This concept may be frightening to those who are ruled by fear. However, that fear will limit their ascension and, thereby, limit their knowledge of the New Earth. Just as you will gradually accept that non-human being are equal to your human power, you will also come to accept that more and more humans are becoming androgynous. These “androgynous” humans are the ones who are learning to balance their male and female energies within their earth vessel. When the balance of your Masculine/Feminine polarity is complete, the balance of tour Spiritual/Physical polarity will also be complete. You will have returned to the Father/Mother, God/Goddess you have always been. Just as some species on your planet can impregnate themselves, you will be able to gestate, and eventually, give birth to, your true Divine Child, your Lightbody. We, the Arcturians and I, are extremely proud of those who have volunteered to restrain this process until the “Moment of NOW,” when your planet has reached the critical mass, to allow Gaia and ALL Her inhabitants to flash into Lightbody. Your Heart Chakra, more than any other chakra, embodies all the concepts of which we have spoken. The Heart Chakra has always been the ruler of relationships, both Male/Female and Personal/Planetary, for this chakra is the Home of your androgynous Soul/Self, which separated into one gender in order to enter the 3D planet, Earth. Also, it is the relationship with, and love for, Earth/Gaia that allows you to sacrifice your personal desires for the good of the entire planet. Furthermore, within your Heart Chakra is your Atma, your Three-Fold Flame of Life, which represents and balances your inner Forces of Wisdom, Power and Love. Last, and certainly not least, your Heart Chakra holds the Heart of the Crystal Matrix. The Heart of the Crystal Matrix is ½ octaves in frequency above your physical heart. It is, in fact, the Three Fold Flame upon which your life-force burns. The Seed of the Crystal Matrix is in your Crown Chakra, ½ octaves above the pineal gland in your physical brain. The Seed of the Crystal Matrix is the entry point of the higher dimensions into your physical earth vessel, whereas the Heart of the Crystal Matrix is where you integrate the higher vibrations into your transforming physical body. The Seed of the Crystal Matrix, within the pineal gland of your Crown Chakra, is the re-entry point for your Masculine Force, which has “scouted ahead” into the higher dimensions to gather Higher Light. Then, the Heart of the Crystal Matrix, in your Heart Chakra, is the point of implantation in which your Feminine Force accepts the gift from the higher frequency; this will allow it to gestate your new Lightbody. In this manner, your Heart Chakra is the womb of your Lightbody. Your Crystal Matrix is also the main processing center for the “experience” to which you are choosing to calibrate. Dearest Ones, I say “calibrate,” as there are myriad realities occurring all the time and everywhere in the ever-present NOW of the Flow. When you are resonating to only the third dimension, your experience is limited to the physical world. However, there are also myriad versions of the third dimension. Until you awaken to your SELF, many of your choices of reality are “chosen” by the “Core Beliefs” that were activated in early youth or “past lives.” You have had to “work hard” to release these limitations. Fortunately, now that you have recalibrated your Lower Chakras you can more easily ground and integrate this Higher Light. Now, your “work” is done and you merely need to “accept” the guidance of your new Captain, your Soul/SELF. So that you can more easily re-calibrated your perceptual channels to receive the fifth dimension, and beyond, without becoming overwhelmed, your new Captain is currently merging your fourth dimensional body with your third dimensional body. You are infinite beings playing a finite game. Whenever infinity takes form in a linear time, it appears as energy consisting of different vibrations. You have many vibrations within you, as you have the infinite energy of your true Multidimensional SELF. Hence, you have ALL possible vibrations within your Soul Signature from the first dimension through the twelfth dimension. Once you can resonate to a vibration, you can communicate with it. It is through the mutual reception of vibratory rates that you communicate with dimensions other than the third. The third dimension is the only plane in which language is laid out in a sequential manner with different sounds meaning different things. In fact, humans are the only beings who communicate in this fashion. Your dear friends, the cetaceans, who have language areas in their brains much larger than your own, communicate in an entirely different fashion. The highest vibrations can only resonate to the Seed of the Crystal Matrix and the Heart of the Crystal Matrix, as they are your primary portals for inter-dimensional travel and communication. The Seed of the Crystal Matrix is able to receive vibrations from the highest dimensions in the manner in which they arrive, which is all at once in the Flow of the NOW. These communications are based on mutual reception of vibration and have NO similarities to human language. Therefore, information gathered in this manner is something you will just KNOW, but you may not even know WHY you know it. The resonance of this vibration is then relayed to the Heart of the Crystal Matrix, within the Atma of your High Heart. Since your Atma, your Three Fold Flame of Life, is the center of your highest Wisdom, Power and Love, it is also able to resonate to vibrations up to, and including, the frequency of the twelfth dimension, Source. The Heart of the Crystal Matrix, the source of your Highest Qualities, is able to integrate these high perceptions into your present reality. Because it is “The Great Integrator,” your Heart Chakra not only integrates the energies of your lower and upper chakras, the polarities of masculine/feminine and spiritual/physical, but also the higher dimensional perceptions and realities into the third dimensional perceptions and realities. “Perceptions” and “realities” are interchangeable terms here, as a reality is actually what you choose to perceive. There are myriad choices for reality in your world, and it is through choosing to recognize a particular stimulus that you create your own reality. If you choose to recognize the higher vibrational stimuli, you will create a higher vibrational reality. On the other hand, if you choose to recognize the lower vibrational stimuli, you create a lower vibrational reality. Let us look again at the Pentagram, “Head in the stars—Feet firmly on the ground—Heart wide open,” as the formula for inter-dimensional communications. First, the highest vibrations enter the Seed of the Crystal Matrix in your HEAD to initiate thought patterns. Since your brain, the receptor of your mind, works in a holographic manner, the Seed/pineal gland is able to create a hologram for this high frequency vibration. The communiqué, packaged in a holographic thought form, is then sent on to your HEART and into the Heart of the Crystal Matrix in your High Heart. Your High Heart is then able to manifest and activate this holographic thought form by integrating it into your present perception/reality. Unconditional Love, which is the strongest force of creation, is the source of this integration. The High Heart assists you to FEEL Unconditional Love, the carrier frequency for this extremely high frequency message, and accept the message into your awareness. Unconditional Love lives in the Flow just beyond the 3D Matrix. When you expand your consciousness in this manner, you expand your perceptions beyond the limited spectrum of the 3D Matrix and become aware of the myriad choices of experience that lie just beyond the illusions of third dimensional drama. The important “next step” is that the higher dimensional communication is sent down into your FEET to ground it in the Heart of Gaia. Once the communiqué is grounded in Gaia, it is shared with the Collective Consciousness of humankind and the Planetary Consciousness of all of Gaia’s inhabitants. Particles, from which all manifestations are manifested into a wave, or form, in “space,” are NOT individual and are actually extensions of the same ONESS. There is a deeper reality, of which most humans are not aware, that exists on a sub-atomic level. You cannot see this deeper reality because you cannot yet sense the extremely high vibrational sub-atomic particles that connect All That Is. Only the Seed of the Crystal Matrix in the pineal gland and the Heart of the Crystal Matrix in the High Heart can only perceive these extremely high vibrations. The Seed of the Crystal Matrix, the source of your highest qualities of thought, can resonate to and recognize these high frequencies, and the Heart of the Crystal Matrix, the source of your highest qualities of emotion, can FEEL the subatomic “life” that ties together All That Is. Separation is merely a third dimensional illusion cast upon your 3D Matrix because your 3D spectrum of perception is extremely limited. Therefore, you cannot recognize the other realities that exist just beyond the limits of your 3D filter. The Seed of the Crystal Matrix and the Heart of the Crystal Matrix are not IN your third dimensional body. Instead they are located ½ octaves above the physical body. Because of this, they are not limited by your 3D filter and are able to resonate to the highest of frequencies. The androgynous, Cosmic Consciousness, Crown Chakra, head in the stars, receives the THOUGHT of the new hologram. This hologram is then sent down to the great integrator, source of Unconditional Emotions, High Heart, heart wide open, to breathe life into the hologram with the EMOTION of Unconditional Love. The Heart then relays the living hologram down into the Heart of Gaia, feet planted firmly on the ground, to ground the hologram in the polarized masculine/feminine 3D reality, thereby creating the INTENTION of keeping this new reality alive by acting upon it. It is in this manner that you will “receive” your Mission, the reason for which you took embodiment in this time/space reality. There are so many of you on Earth now who have waited for this important, transformational lifetime. Your Souls even created petitions to show how your birth in this “time” could best serve Gaia. The Service that you promised to fulfill in your petition is your Mission; the Mission that YOU chose before your embodiment. However, this is not a new Mission, as you have been working towards it, life after life, since you first “logged-on” to the 3D Game. In the last turn through the Photon Belt, during the fall of Atlantis, Gaia had too much darkness on Her form, and nearly self-destructed. Most of you were there then to assist. During the completion of the Galactic Cycle that you are now undergoing, Gaia has called in Her loyal humans who have served Her for many lifetimes. Your Mission now is likely similar to the Mission that you had then. Just as you logged-on to the 3D Game as a human, Gaia logged-on to the 3D Game as a Planet. Through your process of playing this Game with Her, you, too, have become a Planet. According to the rules of this Game, once you are born, most of you forget your personal “puzzle piece” of the “Great Puzzle” of Planetary Ascension. However, you are now beginning to remember. You are also becoming aware that this will be your last assignment in a physical form. Once you feel your final 3D experience is completed, your physical body will totally transformation into Lightbody. Most of you have volunteered to forestall this final transformation until a critical mass Higher Light has been attained in Gaia’s body, Earth, as a catalyst for Planetary Ascension. Your Lightbodies have been slowly and safely developing within the encasement of your physical shell. The casing of this “shell,” which is ruled by your ego/self and perceived as your physical body, grows thinner and thinner as the seed of your Lightbody germinates and grows within the Heart of the Crystal Matrix. As this Seed of your Lightbody sprouts within your Crystal Matrix, it sends shoots into every cell and atom of your physical body, where the germination begins again. When each off-shoot sprouts in each cell and atom, your “junk DNA” is activated and your physical earth vessel displays symptoms of transformation. Your scientists have not found the purpose of this particular DNA, because it is beyond the limitations of their beliefs; hence, the term, “junk DNA.” The scientists cannot perceive what they cannot believe is possible. That is why, dear transforming ones, you must release the “concept of impossible” from your consciousness. “Impossible” is a third dimensional concept, and one that is now obsolete. ALL is possible from the insight of your Soul/SELF. Your Soul/SELF is multidimensional. It is not only male and female, but also spiritual and physical. Therefore, even while it inhabits your earth vessel, your SELF is also traversing your Home vibration in the fifth dimension and beyond. Your Soul/SELF is aware of, and interlaced with, many different experiences, realities, and lifetimes that are all occurring within the same moment of the ever-present Now. You may not yet be accustomed to the expansiveness of your Soul’s reality, while Soul Is not yet accustomed to the limitations of your reality. Nonetheless, the TEAM of Physical ego/self and Spiritual Soul/SELF are a partnership, a relationship. This relationship began when you first separated as you entered the 3D Game. When you complete the 3D Game, you will ascend back into your true Multidimensional SELF and your partnership will expand to embrace All That Is. I now return you to Gaia who will assist you in recalibrating your Heart Chakra so that you may OPEN your High Heart.